Sam Wildow | Miami Valley Today Mayor Kazy Hinds, far right, honors Susan Bollinger, Kayla Miller, and William Bollinger during a proclamation for their efforts to help save the life of a woman who was unconscious in the Walmart parking on Dec. 20. 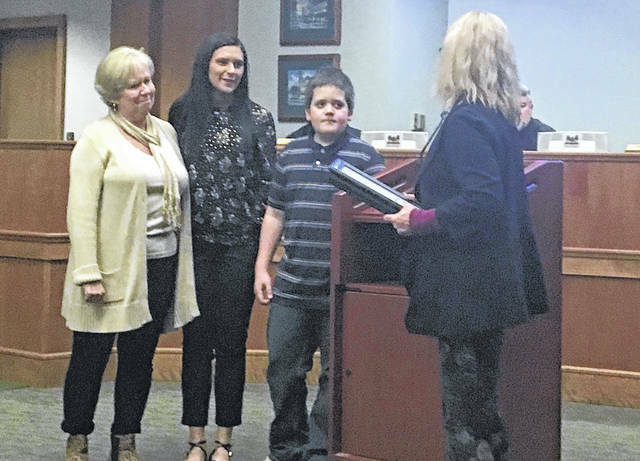 PIQUA — During the Piqua City Commission meeting on Tuesday evening, Mayor Kazy Hinds honored three people whose quick actions helped save the life of a woman having a medical emergency in December. “On Dec. 20, 2018, a woman was found face-down in the parking lot of a shopping center unconscious and barely breathing,” Hinds said. Hinds said that three bystanders — Susan Bollinger, William Bollinger, and Kayla Miller — came to the aid of that person. The incident took place on Dec. 20, in the parking lot of Walmart, 1300 E. Ash St. A medic from the Piqua Fire Department transported the patient to Upper Valley Medical Center. The medical emergency that the patient experienced was not disclosed due to HIPAA privacy laws, but Hinds said that the patient was recovering well. “We thank them for their heroic actions,” Hinds said. Later during their meeting, the commission waived the three-reading rule and approved an ordinance amending Chapter 33 of the Piqua Municipal Code Employment Policy, inserting a section with language regarding sick leave for non-union employees. City Attorney Frank Patrizio said that an earlier version of these changes left open a liability for the city. The commission then approved a one-year lease with Piqua Youth Baseball and Softball Association (PYBSA) for use of the baseball fields and concession stand at Pitsenbarger Park and Sports Complex. The commission then approved levying assessments to pay for the cost of nuisance abatements, such as grass and weed cutting, trash and debris removal, property maintenance, demolition of structures, and so on. The city is seeking a reimbursement of approximately $7,849 from property owners. The commission authorized agreements for easements and rights-of-entry on property located at 1319 Stratford Drive in the Echo Hill subdivision. The cost of the easements and rights-of-entry are not to exceed $4,400, which includes a 5 percent contingency. The commission also held a meeting with the Piqua Health Board. They appointed James Burkhardt, D.O., of Piqua, as the medical director of the Piqua Health Board. The expected expenditure is $4,800. During the public comment portion of the meeting, a resident brought forward a concern about a home-based business on Forest Avenue. The resident said that the business was creating traffic congestion on the street and in the nearby alley. At the end of the meeting, commissioner Bill Vogt encouraged people to consider running for office on the commission. “I’m not going to run for city commissioner again,” said Vogt, who has been on the commission for 16 years. Commissioner Kris Lee and Hinds thanked Vogt for his service on the commission. Lee also encouraged residents to celebrate Black History Month after talking about a breakfast that Hinds and he attended at Transformed Life Church in honor of Black History Month. He also spoke about its importance in his family. “In my house growing up, black history was pretty significant,” Lee said. He then read a favorite poem of his parents, Maya Angelou’s “I Know Why the Caged Bird Sings,” in honor of Black History Month. Lee also thanked the Public Works Department for their snow removal efforts during the recent winter weather over last weekend. “I’ve heard from lots of satisfied citizens,” he said. The commission ended their meeting by going into executive session for the purpose of discussing pending or imminent litigation. https://www.dailycall.com/wp-content/uploads/sites/30/2019/02/web1_Susan-William-Bollinger-Kayla-Miller-Kazy-Hinds-CMYK.jpgSam Wildow | Miami Valley Today Mayor Kazy Hinds, far right, honors Susan Bollinger, Kayla Miller, and William Bollinger during a proclamation for their efforts to help save the life of a woman who was unconscious in the Walmart parking on Dec. 20.